What’s perhaps most remarkable about this NBA season to date is how little of the discussion around the league has actually centered on it. Yes, there’s a ton of NBA talk daily on national TV and radio and in print outlets, but a whole lot of that isn’t about the 2018-19 campaign itself, but rather the approaching summer of free agency. And Smith is far from alone. So much of the discussion around the Green-Durant saga has not been about what it could mean for this year’s Warriors, but what it could mean for the team going forward. 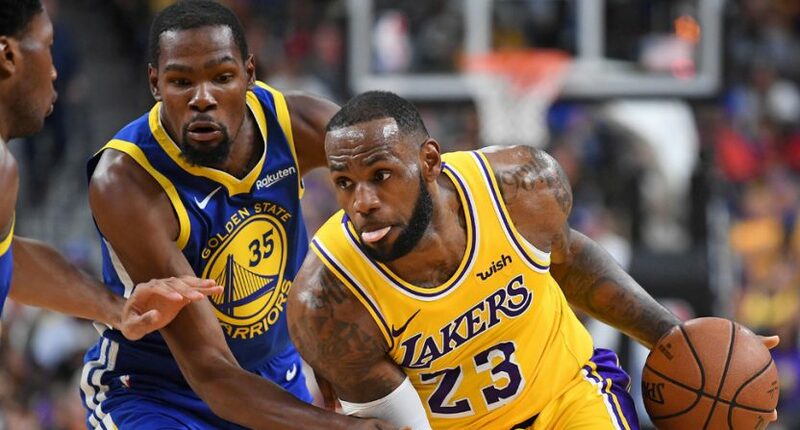 We’ve seen both pieces that feel more sympathetic to Green (like one from Marcus Thompson of The Athletic) and ones that feel more sympathetic to Durant (like one from Ray Ratto of NBC Sports Bay Area), but both flavors have really focused on what this fight could mean for the 2019-20 season, not what it means for this year. ESPN’s The Jump also focused on the down-the-road implications in a segment Wednesday. Reading, listening to, or watching these pieces, it sure doesn’t feel like there are almost five full months ahead until the 2018-19 regular season ends on April 10, or seven until the Larry O’Brien Trophy is awarded in June after the playoffs. It’s not just the Warriors, either. Much of the current coverage of LeBron James and the Los Angeles Lakers is focusing on this as a building year, with LeBron’s tenure there really only starting after they get another top free agent or too this sumer. Much of the coverage of teams like the Boston Celtics and Philadelphia 76ers isn’t about how good they currently are, but about how well they can position themselves as compelling free-agent destinations. And even discussions about what’s next for Carmelo Anthony following a projected cut in Houston aren’t just about this year, but if he can add anything to teams in the coming years. It’s as if much of the NBA media is playing NBA 2K19 and has decided to simulate the 2018-19 season to end before picking up their general manager duties in the offseason. Yes, there’s some logic to discussing the modern NBA this way. The Warriors are 12-3 after a win over the Atlanta Hawks last night (only by seven points, though, so sound the alarm! ), which puts them two, three and four wins respectively ahead of the Portland TrailBlazers, the Denver Nuggets and the Los Angeles Clippers in the Western Conference. There aren’t a whole lot of people currently opining that any of those teams will give Golden State a real run for their money in the playoffs. And out east, the current top-four of the Toronto Raptors, Milwaukee Bucks, 76ers and Indiana Pacers also isn’t inspiring a whole lot of “they can beat the Warriors!” conversation. Maybe teams currently outside the top four like Boston, Oklahoma City or even the Lakers or Rockets (10th and 12th in the West at the moment, respectively) will improve over the rest of the season, or maybe the current top-four teams will look like more of an actual threat as time marches on. But there is some support for the idea of 2018-19 as an inevitable outcome. However, that doesn’t necessarily mean that all media discussion of the current season should be punted. And it’s interesting to compare what’s going on with the NBA to how things are in other sports. In the NFL, for example, there’s almost no offseason talk at the moment. Instead, much of the discussion is focused on who will win this year. Some of that’s thanks to a wider field (teams like the Chiefs and Rams have done very well so far, but perennial contenders like the Patriots are still looming, and there are lots of other teams in the mix too), and some of it’s thanks to a limited-by-design offseason (franchise and transition tags mean it’s harder for players to move in the NFL). There’s also a looming draft class without a lot of hot-button prospects (Mel Kiper Jr.’s latest ESPN rankings have three offensive skill players in the top 25, including only one quarterback (Oregon’s Justin Herbert at #5), and it’s much harder for debate shows to argue the merits of defensive ends or offensive linemen instead of quarterbacks), and that’s all adding up to keeping the focus on the game on the field. But college football is perhaps an even more interesting comparison. There, there’s a team (the No. 1 Alabama Crimson Tide) that’s the closest analogy you’ll find to the Warriors in North American sports, with a whole lot of people already assuming they’ll be the champions at the end of this year. And yet, that hasn’t really killed the discussion of this season; there’s still interest in if anyone can knock off Alabama (especially in the SEC championship game or in the playoff), there’s interest in who the other three playoff teams will be, and there’s interest in who’s going to be picked for the New Year’s Six (non-playoff) bowls. And Alabama’s dominance has been anything but bad for college football as a whole from a ratings perspective so far, with their 29-0 blowout win over LSU two weeks ago coming in as the highest-rated game of the season. The NBA also has a remarkable degree of player agency compared to leagues like MLB and the NFL, with more player movement allowed and players more easily able to make a major difference at a new team, and that’s helped boost the focus on the offseason. And it’s also interesting that as compared to college football, where there’s a similar consensus on who’s going to win, the spotlight has remained with the Warriors in the NBA. In college football, a lot of the discussion is about who will be the #2 to #4 playoff teams, and no one seems to particularly care about that in basketball. Maybe that’s because of a larger playoff (with 16 teams making it, there really isn’t much question of a potential title contender being left out) or a results-based system as opposed to one determined by a committee vote, but it’s really notable that there’s so little discussion of an ongoing season. And maybe this approach will be proven right. Maybe it’s more worthwhile for Stephen A. and Max Kellerman or Skip and Shannon Sharpe to debate the ins and outs of the Warriors’ locker room and what that means for 2019; for one, that’s a story with a larger base potential audience (fans of all teams players like Durant could conceivably go to) than if they were just discussing the Warriors’ lineup this year, and for another, they can drop all the hot takes they want without being proven wrong any time soon. And that doesn’t require extensive film study of the Warriors or their potential playoff opponents; it’s all just opinions on where someone like Durant might wind up, and strong opinions are what these personalities focus on. But it sure makes for odd media discussion around the NBA. If someone with no knowledge of the league was reading about it, they might think it’s actually the offseason, rather than a season with almost five full months of regular-season play and then a couple of months of playoffs left.